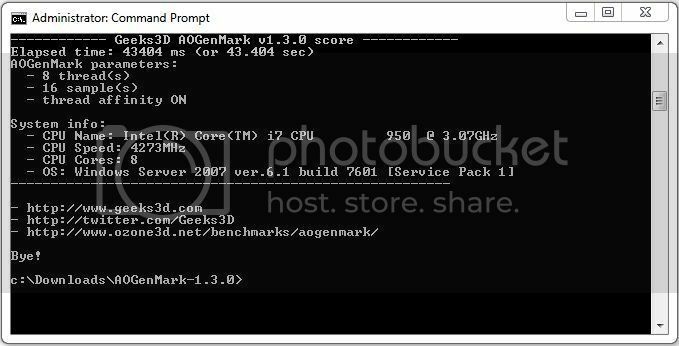 AOGenMark is a CPU benchmark with multi-core support. 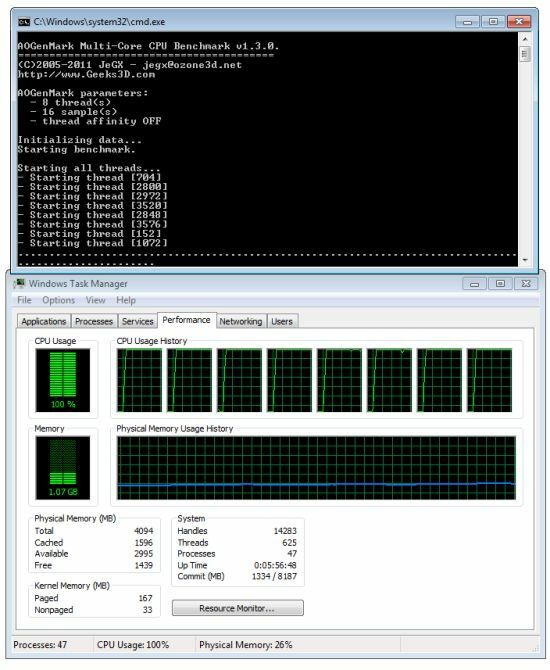 Multi-core support simply means the benchmark is multi-threaded. AOGenMark is not a new CPU benchmark: the first version has been released in 2006. AOGenMark is derived from a tool I used several years ago to compute per vertex ambient occlusion factor. I recently updated this benchmark utility for the HP Mini 210 review. That said, AOGenMark is a command line tool with few parameters. In short, you can specify the number of threads (-t), the number of samples (-s) which are related to the heaviness of computations (the more the samples, the heavier the computations) and the thread affinity (-a). Thread affinity allows to stick a thread with a CPU (logical) core. For example, if you have two cores and you launch AOGenMark with 4 threads, thread 1 with run on core 1, thread 2 on core 2, thread 3 on core 1 and thread 4 on core 2. Starts AOGenMark with 4 threads, 8 samples and no thread affinity. Starts AOGenMark with 8 threads, 16 samples and thread affinity enabled. How to bench a CPU with AOGenMark? It’s simple: the smaller the elapsed time to finish the bench, the faster the CPU. For recent multicore CPUs, the number of samples should be at least 16, the number of threads depending on the CPU: 8 threads for a Core i7 with HT enabled is a good idea. That’s all for the parameters. I added in the zip file six .bat files for launching AOGenMark with 1, 2, 4, 8, 16 and 24 threads, 16 samples and no thread affinity. From my tests, it’s better to let the thread management to Windows. Here are some scores. And recall that the smaller the elapsed time to finish the bench, the faster the CPU. // Part 1: Slowest part of the algorithm. // Part 2: Fastest part of the algorithm. // It's like computing mesh normals. So this does use the HT parts of the cores, saving about 17 seconds. I tried running this on my 3 core Phenom II system and it keeps stopping at the same point after doing 2.5 lines of dots. It says it’s having a problem in the .dll file. 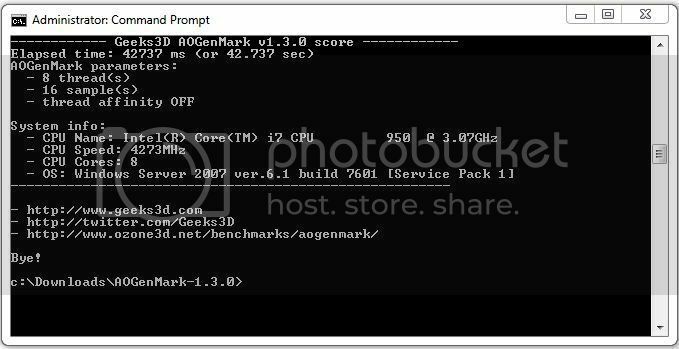 AOGenMark Multi-Core CPU Benchmark v1.3.0. One problem with the benchmark it doesn’t run on triple or 6-cores. Program crashes.